There are many types of lasagna dishes in Italian cookery, and in each is wonderful in its own way. But to my mind there are two “Ur-lasagne“, each typifying the northern and southern poles of Italian cuisine: Lasagna for Carnival, or lasagna di carnevale from Campania—the kind of lasagna that nonna Angelina made—and Bolognese Lasagna, or lasagne alla bolognese, from Emilia-Romagna or, more precisely, Bologna. Both combine creamy and savory layers between large sheets of pasta, but the results, both delicious, are very different. Today let’s look at Bolognese Lasagna. At its most essential, it is actually a rather simple dish: ragù, béchamel, parmesan cheese and pasta are layered in a baking dish and baked until a light crust forms on top. But, of course, the reality is not quite that quick and easy, as each component (other than the cheese) requires its own preparation before the dish is assembled and baked. In fact, it is best to budget several hours, over two days, to make this classic dish. Step 1: Make the ragù: This is the real ‘heart’ of the dish that gives the dish its savor. Since it takes several hours to make, and benefits from an overnight ‘rest’, better to make your ragù the day before. The recipe is set out in this post. Step 4: Cook the pasta and assemble the dish: Take your pasta sheets and simmer them, only one or two at a time, in well-salted water for just a minute or two, depending on just how thinly you’ve rolled out your pasta, and how long the pasta has been drying. As each pasta sheet is done, fish it out of the water with a slotted spoon (the larger the better) and place it on a towel. With another towel, pat it dry. Then place the pasta sheets at the bottom of a greased baking dish, covering the entire bottom of the dish. It’s OK to overlap the sheets a bit, but if there’s too much overlap or the sheets are too big for the dish, you can always trim the cooked sheets to size. Step 5: Baking the lasagne: Bake in a moderate oven (180°C, 350°F) for about 30 minutes, or until the top is just slightly browned on top (see top photo). Allow to rest for at least 15 minutes before serving. Although strictly speaking Bolognese Lasagna is a primo, or first course to be followed by a meat dish, from reading the recipe you will readily realize that a healthy portion is a meal unto itself, perfect as a piatto unico for all but the heartiest appetites. Similarly, these lasagne is best when it can rest for a while before eating. Right out of the oven, the béchamel and ragù are still very loose and the lasagne will tend to fall apart as you cut into it, depending on how much sauce you have layered in. I usually let it rest 15 or even 30 minutes, which gives it time to compose itself and firm up enough to cut it. In fact, if you allow the lasagne (or any baked pasta dish, for that mattter) to cool off, and then reheat it gently, it will have an entirely different, solid texture, almost like a cake. Many people like it better that way. The thickness of the pasta will also influence the ultimate outcome. For this kind of lasagne, I tend to like to roll the pasta out quite thinly, which produces a more delicate dish, at setting “5” or thinner on my KitchenAid pasta roller. There are various ways to cut down on the work involved in making this dish, the most common being buying the pasta rather than making it yourself, which you can certainly do. Just be careful since much of the so-called lasagne available commercially, even the ‘fresh’ kind (in the US at least) is not really fit for making this kind of lasagne. Look for thin sheets, not made from durum wheat flour, if you can find it. There also exist ‘no-cook’ lasagne, which supposedly don’t need pre-simmering and can be placed raw into the baking dish. Personally, I have never been satisfied with the resulting texture. But one short-cut is, to my mind, inexcusable: jarred, commercially made ragù, or ‘bolognese sauce’ as it is sometimes called in English. It’s a travesty to be avoided at all costs. As mentioned above, the ragù is the heart of this dish, and frankly if you need to cut corners there, you might as well just make something else that requires less time to make. And in Italy, you can even buy pre-made béchamel, but this, too, should be avoided. It tastes like glue! 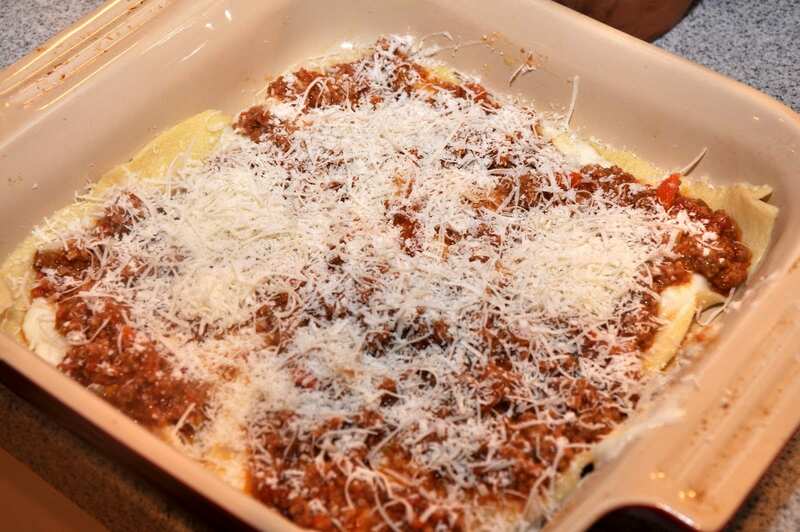 Measurements: The outcome of your Bolognese Lasagna will very much depend on how much ragù and especially béchamel you layer in between the pasta sheets. Too little and the dish will come out rather dry and not very savory, too much and the dish will be ‘slippery’ and rather stodgy at the same time. But between these two extremes, I’ve had lasagne made all different ways, each has its fine points. I would experiment with different ratios until you find the consistency you like best. Any easy to remember rule of thumb: Marcella Hazan recommends using about 2 cups each of ragù and béchamel for pasta made from 2 eggs. As for myself, I usually make more than enough of both sauces and then use my eye and instinct. The leftover sauces can be used various ways, including mixing them with rigatoni to make a simple pasta al forno during the week. Although this dish is from Bologna, it (or some variation) typifies the lasagna that will be found on tables more or less all over central and northern Italy. Although Rome is, in many ways, a southern city, it is this version of lasagna that you will most likely find in restaurants and on home tables. there Further south, béchamel sauce gives way to ricotta mixed with eggs and cheese, and ragù alla napoletana replaces ragù alla bolognese, and bits of sausage and tiny meatballs, sometimes even slices of hard boiled egg, elaborate the dish. It was this southern version, known as lasagna di carnevale, that nonna Angelina would make on Sundays. Step 1: Make the ragù: This is the real 'heart' of the dish that gives the dish its savor. Since it takes several hours to make, and benefits from an overnight 'rest', better to make your ragù the day before. The recipe is set out in this post. Step 4: Cook the pasta and assemble the dish: Take your pasta sheets and simmer them, only one or two at a time, in well-salted water for just a minute or two, depending on just how thinly you've rolled out your pasta, and how long the pasta has been drying. As each pasta sheet is done, fish it out of the water with a slotted spoon (the larger the better) and place it on a towel. With another towel, pat it dry. 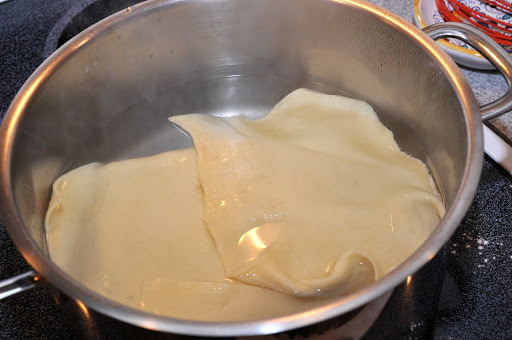 Then place the pasta sheets at the bottom of a greased baking dish, covering the entire bottom of the dish. It's OK to overlap the sheets a bit, but if there's too much overlap or the sheets are too big for the dish, you can always trim the cooked sheets to size. To make this dish, please print out the recipes for ragù alla bolognese, béchamel sauce and fresh egg pasta, following the links provided in the post. Turned out beautifully the first time and won over the crowd at the dinner table. It was my first time making pasta from scratch and everyone was amazed by the delicate nature of the pasta. The second time I made it, I added a healthy dose of salt to the meat sauce to give it a bit more savoriness. Wonderful recipes for the egg noodles, bechamel, and meat sauce. Thank you! That’s fantastic, Binh! So glad you liked the recipe. And thanks for leaving a comment. Pure perfection! Slow and steady did the job. Cooked the ragu for over three hours, made the bechamel over very low heat, and boy did it turn out great! Wonderful! Glad you it turned out for you.It is a heavenly dish when it’s well made. I tend to do lasagne with ragu or lasagne with bechamel and have been meaning to combine. The tutorial is very helpful. Dare I try something new on Christmas Day? Thanks for this very profitable lesson, now I know to make a perfect lasagna! Many thanks! Now that's going into detail about how to make a perfect lasagne. Highlight/copy/paste/print. Frank,I followed your recipe tonight (except I used pre-made pasta) and it turned out great. Thanks for helping to rekindle memories of family visits to my Italian grandparents and relatives in Ocean City, NJ. Nice Lasagne Bolognese write up…Bravo! You covered pretty much all the bases except the difference between lasagne in Italy and the US. It's a much deeper dish affair in the US. Most times in Italy it's not much more than an 1″ or an 1 1/4″ deep, a bottom layer, maybe a middle and a top layer. I think that's why it can be served as a primo. But you are dead on right that its hard to find good pre-made pasta in the US that's thin enough. This looks really yummy and warming. Something new for me to try soon! Thanks, everyone, for all the kind comments! Truly gratifying to get all your feedback. @citronetvanille: quite right–I forgot to mention the cold water bath, although I sometimes skip it, it does prevent sticking as you say. I'll have to tweak the post–thanks! @Kelly, I don't have too much experience with vegan lasagna–what sort of pasta are you using and what kind of filling? If the pasta is made with just flour and water, there might not be such a need to pre-boil it, depending on the kind of flour you're using, and the other ingredients. My children love lasagne. They would want me to cook immediately if they see this now. Looks delicious. Lasagne was always simply lasagne to me until I read this post. It's not that simple at all – but it is beautiful and a real favourite with my family. Thanks for sharing this wonderful recipe and all the 'lasagne' information. This is just gorgeous. I just like the amount of detail you get into it. Delicious! Loved the detailed instructions. man – you just stole my heart (and stomach) with this one….it is a must and soon to be on my table … thanks dear friend, this may just be your best yet!!! This looks delicious! I just bought a pasta maker–I love it. But I have a question–I made my own (vegan) homemade pasta sheets for lasagna last week, however, I did not pre-boil them. It turned out delicious nonetheless. What are your thoughts on boiling before vs. non? I am worried I missed on something here–but it did turn out delicious! Thanks! Lasagne is one of the first dishes I ever cooked. The recipe I had was from my friend's mom and it was not an authentic one but very tasty. Last summer I made an authentic Lasagna alla Bolognese. I did not simmer the ragu for 6 hours but it turned out very good. I also used ready made Lasagna, I still never made any pasta at home but it is on my to-do list. In The Marche we make them exactly the same way, one thing I do after I cooked the sheet in water, I place them in a big container of cold water, then I dry them. It prevent them from sticking. Now I am hungry!